Quiet and calm DIANA Hotel – a hotel in Dnepropetrovsk of 10 hotel rooms – is the ideal place for comfortable and pleasant stay. You will be close to the city center, but neither city noise nor central prospects bustle will not affect your recreation or work. A quiet and comfortable DIANA Hotel in Dnepropetrovsk with 10 hotl rooms is an ideal place for favorable and convenient stay in our city. You will be close to the city center but neither bustle nor central avenues noise will interfere with your recreation or work. Home atmosphere, our personnel hospitality and unobtrusive servicing will make your stay unforgettable. At DIANA Hotel in Dnepropetrovsk you can be offered full board on your request, and your order will be delivered shortly from the best restaurants of the city. We have a 24-hour bar for our guests. A spacious hall with convenient tables and vast recreation zone with soft sofas and a TV with a plasma panel can be transformed into a small conference hall for more than 20 seats. Floor suite in a private hotel in Dnepropetrovsk "Diana" - a one-room , which consists of hallway, bathroom and living room. Room is equipped with modern forced ventilation and air conditioning.Room : two single beds ( one double), reclining couch, coffee table, TV with a diagonal of 29, fridge, minibar, telephone. By having your laptop can connect to the Internet. In the hallway there is a spacious built-in mirrored wardrobe for clothes.Bathroom: shower, bath, sink, bidet, toilet, hair dryer. Luxury bathroom decorated with ceramic tiles and equipped Santeh Nika - German production. 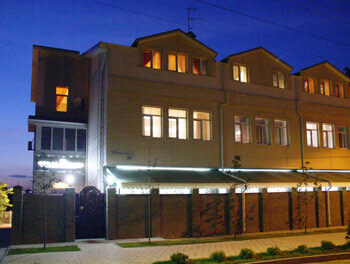 Hotel Diana in Dnepropetrovsk provides for single or double occupancy rooms Junior Suites. Standard rooms, the most popular category in a comfortable hotel in Dnepropetrovsk, different low cost accommodation, while equipped with everything necessary for a comfortable stay. The suite consists of a living room, hallway and bathroom. Room: one double bed or two standard beds, TV 21", desk and telephone. In the hallway a spacious built -in mirrored wardrobe for clothes.Bathroom: shower, sink, toilet and bidet. Luxury bathroom decorated with ceramic tiles and equipped with German-made fixtures. - The system of video surveillance and security. - Long-distance and international telephone. - Taxi. - Check w / d, and air tickets. - Safe (at the reception).